Let the baby season begin! Before anyone gets too excited, not my baby :). 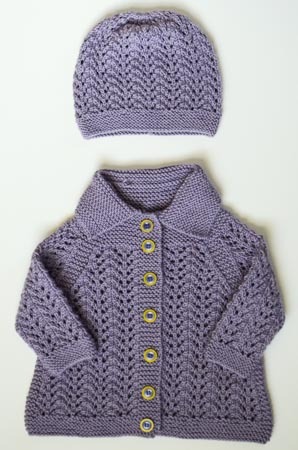 But there does seem to be another wave of babies expected in 2013, and this knitter has her needles at the ready! First up, a gift for a friend who’s expecting a girl this May. Pattern: Inky Dinky Jacket and Hat by Anne Hanson. I first noted this gorgeous pattern on the lovely Eloise, and it was only a matter of time before the right recipient came along so I could knit it! I knit the 6 month size of both jacket and hat, without too many modifications! 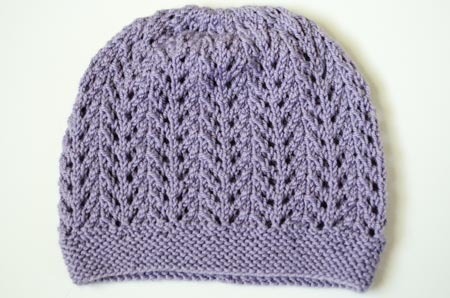 Oh, yes, you might have noticed that it’s a different stitch pattern – I had to change that. As beautiful as the original is, I just couldn’t keep up with the massive chart. I subbed the significantly-easier stitch pattern from Elizabeth Zimmermann’s Baby Sweater on Two Needles (February) from the Knitter’s Almanac . I think it worked out very well. Yarn: Louet Gems Merino Sportweight in color 09, lavender, two 100-gram skeins almost to the last yard! I’ve had this yarn in my stash for almost as long as I’ve been knitting – I bought it off eBay years ago for a song, as they say. The color has been long discontinued. I could never think of the right project to knit with it, but this one was perfect. 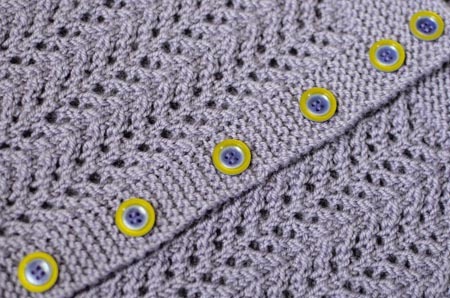 I paired this very classic color with interesting buttons! The buttons are from the now defunct Windsor Button. Where else could I have found such great buttons?!? Oh, the sadness :(. Needles and finished dimensions: As recommended, US 3 and 4 circs and dpns. After blocking, the sweater is about 19.5″ across the chest, 11″ from hem to shoulder, and 5″ from cuff to armpit. The hat is 14″ in circumference and 6″ deep. I know the hat pattern was written to be more of a beret than a hat, but I think my version is going to be more of a slouchy hat. Everything is super stretchy, but I think this set will fit a 3-6 month old: so, for this May baby to wear this fall/winter. All in all, I really liked the styling of this sweater – the A-line silhouette, the lovely little collar, the garter stitch edgings. I did find the actual pattern a little wordy, but I don’t think I’m allowed to complain about that, as I write wordy patterns myself ;). Just push through – Anne Hanson has you in good hands :). Speaking of knitted baby items, I walked into a coffee shop this morning and saw a beautiful bright pink Odessa on a baby. I asked the parents who the knitter was, and the mother said she had found the hat in a thrift shop! I gave them a brief rundown of the hat and the designer, and they were charmed and thrilled to know a little more about their favorite baby hat. those buttons were a great choice for that yarn colorway. it’s a shame to know that i can’t get them for myself :what a gorgeous piece! What a pretty outfit; the pattern and color are beautiful. Lucky, lucky baby girl! What a lucky baby! It looks great. Lovely sweater! I think this will end up on my queue! Very sweet! I am doing a fair amount of baby knitting lately, so I will have to keep this one in mind! That’s a lot of buttons. It’s been ages since I did a baby knit. I need to pay more attention to my knitting friends scattered about. 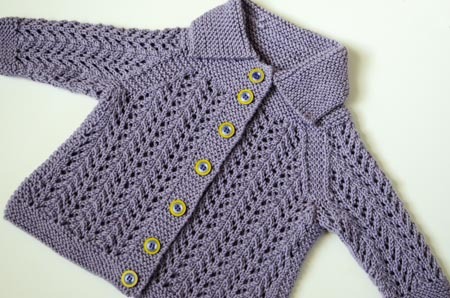 Surely there’s someone who needs a baby knit!